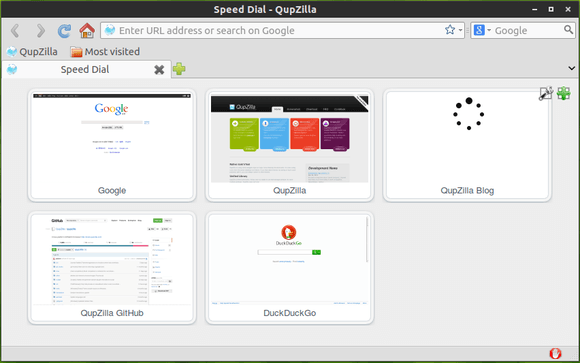 QupZilla is a lightweight and very fast QtWebKit browser. It has been originally started only for educational purposes. But from its start, QupZilla has grown into a feature-rich browser. The latest version 1.6.1 added option to enable tab switching using the mouse scroll wheel; a toggle to disable inline URL completion in the address bar; and the ability to launch full-screen mode using the command line. These commands will install the QupZilla from its official PPA. Supports Ubuntu 14.04, Ubuntu 13.10, Ubuntu 12.10, Ubuntu 12.04, Linux Mint and their derivatives. QupZilla will in future be ported to QtWebEngine, which will (amongst other improvements) bring multi-process architecture. With QtWebEngine comes dependency on Qt 5, which means older platforms may not be supported. QupZilla on QtWebEngine will be new major version 2.x.x and I hope it will be ready with Qt 5.3 (or Qt 5.4), depending on Qt devs. QtWebKit browser QupZilla 1.6.0 has been released a few days ago. Here’s how to install it via PPA in Ubuntu 13.10, Ubuntu 13.04, Ubuntu 12.10, Ubuntu 12.04, Linux Mint and their derivatives. This release comes with new TabBar implementation that supports scrolling through all tabs when tabs don’t fit at all into TabBar. So it means, no more overflowing of tabs! LocationBar received new completion feature – inline completion. You can now write only first letter and the most used domain will be completed. Once you see the completion, you can just press Enter and load the site. For Ubuntu 14.04 Trusty, the latest version is available in Ubuntu Software Center.